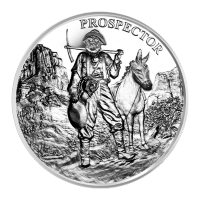 líc Prospector s mezkem ve skalnatém údolí a slovo "Prospector"
rub Mapa, sextant, kompas a lano položené na stole a slova "One Troy Ounce 999 Fine Silver"
Prospector s mezkem ve skalnatém údolí a slovo "Prospector"
Mapa, sextant, kompas a lano položené na stole a slova "One Troy Ounce 999 Fine Silver"
Stříbrná mince Prospektor 1 oz These one ounce rounds are a terrific value, and one of the lowest premium ways to add to your stack! The idea of a lone prospector carries enduring appeal as one person with a dream battling the odds and Mother Nature in an attempt to secure their fortune. The obverse of this round displays an 18th or 19th century prospector, gold pan in one hand and pick axe in the other. His trusty mule is at his side. The reverse features a wooden table as the background of the field along with the tools of the trade for a prospector including rope, a map, a compass and a sextant. Great value and an interesting design set this round apart from the rest, order yours today.